As I mentioned in my last post on Declaring GTD Bankruptcy, I recently decided to switch my personal GTD system to make better use of my new Ipad 2. Besides the value of having to reconsider all my priorities in the migration process, the main driver was to get away from my home desk a bit more. I spend a lot of time at my office keyboard and was spending a correspondingly high amount at my home desk for a variety of things. The Ipad can get you away from your desk for many activities where you are just consuming information (reading/deleting mail, news, searching) and reduce desk time to more focus on creating things and keyboard-intensive activities. Using the information and tools on the ActivityOwner.com site you can do quite a bit to synchronize information back and forth between your MindManager maps and mobile-accessible formats (e.g. dropbox), but that can be a bit clunky and it introduces a delay between when you add or complete something and when you next refresh your dashboards. I continue to use ResultsManager at work, although to be honest I spend most of my time just taming my inbox with OutLinker. I tried a few web-based tools including Remember the Milk and Nozbe but they didn’t resonate for some reason. Nozbe’s reoccuring cost is reasonable but a bit of a deterrent. I initially stayed away from OmniFocus for Ipad since its is an Apple application and has no Windows counterpart, but the reviews and functionality looked good. At $39.95 it is not cheap for an Ipad App, but I figure you get what you pay for so I took the plunge. It is great to be able to capture/process/plan/review/do on the move away from my PC as time permits. The quiet Sunday morning “Weekly Review” is a nice concept, but doesn’t always materialize. OmniFocus organizes itself in realtime. There is no dashboard refresh step between when you change something and when it shows up in your lists. OmniFocus tracks your “Weekly Review” on a project by project basis. By default, each project puts itself up on the “Review” list on weekly basis, but you can change this default to any frequency you wish. This is a nice way to ensure your “Someday” items get a once over at some frequency and that you continue to have the right next steps for your active projects. This means you can do a partial review of your projects and pick up where you left off when you next have time. This concept could be a nice addition to the Next Action Analysis framework and would just require a standard way of leaving another type of date stamp on a project (perhaps as a tag). OmniFocus lets you organize your projects in a folder structure and also allows for sub-contexts. 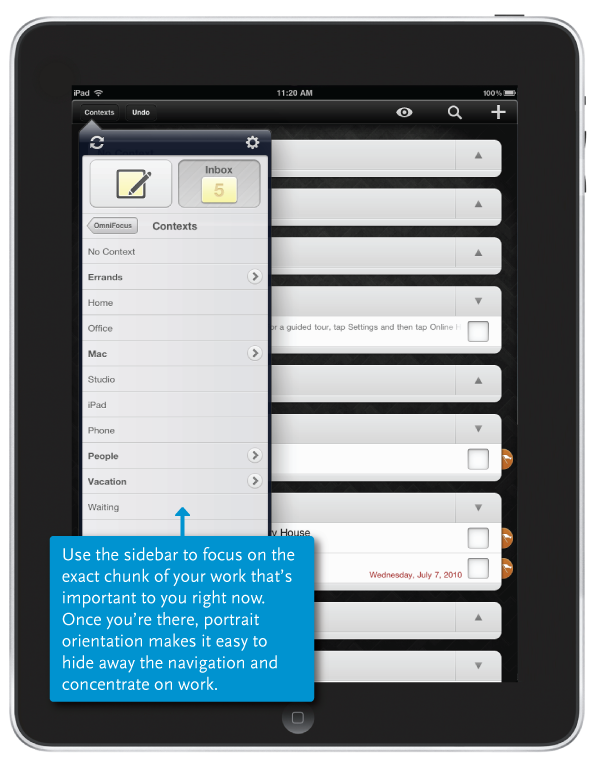 You can choose to limit your “focus” on a folder or sub-folder of activity or on a context. OmniFocus has a very rapid “Search” feature that gets you to tasks and projects quickly. You can easily convert tasks to projects or move tasks to a new project. Reorganizing contexts and folders is also easy. Its repeating task capabilities are fairly good. Its not quite as advances as Mark Task Complete, but is more than adequate. The program and data are native to the IPad. It doesn’t suffer from web delays and does not require an internet connection. As a stand-alone fully capable GTD application, $39.95 is not a bad deal. The functionality seems “just right” for the task. I am not familiar with the desktop version of OmniFocus, but I get the sense that the developers have slimmed down from its (perhaps bloating and complex?) function set down to the key features. If veteran OmniFocus users find any of these observations off-track, let me know, I may not fully understand the capabilities at this stage. If you are not a Mac user, your data is relatively stranded and not backed up. It it synced to itunes when you sync your Ipad, but you don’t necessarily do that very often, and doesn’t provide that much peace of mind when you do. If you misplace your Ipad you need to buy a new one to get at your lists? It doesn’t highlight “Projects needing next steps” like ResultsManager does, although timed periodic project review helps catch those. It doesn’t highlight “aging” tasks like Next Action Analysis. While you can email individual tasks, you can’t export or print a full to do list. It doesn’t provide the month-based archiving of completed tasks that Mark Task Complete provides. Its not a team-oriented tool. Typing speed is slow and there is no MindReader to facilitate mark up. Its ability to prioritize is limited to whether something is flagged or not. Attaching information to a task or project isn’t that easy. You can send web links from Safari to OminFocus. Its not web-based, so you have to keep your ipad handy (e.g. carry it to work rather than pull up web app at lunch). The first four items were somewhat concerning to me, particularly the stranding of data and potential disaster recovery issues (I don’t need involuntary GTD bankruptcy at this point). After a bit of googling, I discovered that OmniFocus uses xml as its native data storage format, which liberates the data in an albeit cryptic organization. MindManager can actually open xml files, which allows the content to be processed with macros. I used this approach several years ago to develop import routines for BaseCamp and (non defunct?) nactionr. I found I was able to take a similar approach with the main contents.xml file that stores the OmniFocus information. Getting access to the data is a little involved if you are a PC user. I needed to set up a webdav folder with DreamHost to sync the data with. This wasn’t a big deal since I’m already set up with them for the blog. Disclamer — referral fee goes to AO charity if you sign up via that link. Setting up the extra sync destination made sense in any case as a secondary backup/restore strategy. If you are a mac user of the desktop application, you can probably get the contents.xml file directly. The first version of the Omni2Map addin is now available for download (version 9 only). It will export your OmniFocus data into a MindManager map and mark up your projects and tasks with due dates, contexts, etc. It uses ResultsManager conventions, which enables the exported information to be processed with ResultsManager and Next Action Analysis on a periodic basis. I’ve only used it a few times, but it addresses concerns 1-4 for me now (and likely #5 as well once I unfilter completed tasks). This is an early version that is sure to have bugs and usability issues and needs a blog post of its own, but I figured I’d share it now for those that are interested in giving it a try. I am in exactly the same position – I have an iPad (my only Apple product) and I purchased OmniFocus as the best of breed GTD app straightaway. I have not really used it however as I also need to see & update projects and actions on other devices. What you are proposing looks really useful. Are there any prerequisites for this to load? Thanks for giving it a try Richard. I think the version I uploaded may have been configured for debugging and not work outside my machine. Try the latest release at same link (1.1.001). If you get same problem, can you repost the screen shot link? It didn’t come through in the comment. The link isn’t working – giving ‘File not found’. I tried changing the version number to 1.1.001 as you mention in your comment but that is not found either. Sorry — download link is fixed now. Thanks for patience. Thanks Richard — I would never have caught that bug. It was due to some code I had cloned from MindReader and would only surface on a computer without MindReader installed. Give the latest one a whirl (002). I will get this working for you. I think you will enjoy the output. This causes MM to crash a couple of times until the add-in is fully removed. I am going to be out most of today (it’s 08:30 Sunday here in the UK) but will pick this up again as I am very keen to explore this! OK — I took the novel step of actually testing it on a fresh machine and after several iterations I think its working now. Just curious — how are you getting your contents.xml file? I’m hoping there is an easier way for the average users than webdav. One thing I am finding is that this add-in isn’t uninstalling the previous version when you upgrade. Until that is worked out, please manually uninstall previous versions from the control panel. Now this is exciting – as a former Resultsmanager user now using OmniFocus on my MacBook, iPad and iPhone I can´t wait to see where this goes. Glad I´m still following your site! Yes! It now works – and good to see the result! I have been uninstalling the previous version before trying the new one anyway so that’s not been a problem. I think the only way you can get contents.xml is if you use one of the sync methods. I have a MobileMe iDisk account which OmniFocus ‘syncs’ with – it puts a zip file containing contents.xml into an OmniFocus.ofocus folder. Once I had found that it was easy to copy it to my PC with MindManager on it. I notice that the mindmap that is created only contains branches that represent folders and items in those folders. If you have projects that are not set up in folders these do not appear. To be honest I have not fully understood the different uses of projects and folders but a number of my projects stand alone outside of folders. Thanks Richard — I think the new versions are correctly replacing previous ones now. I put the version number in the dialog at start so I can watch that. Thanks for bug catch on the root folders. I organize all my projects into folders by area of focus (e.g. family, finance, etc) so I hadn’t noticed that issue. I will try to fix soon. I discovered this afternoon that you can get the contents.xml file from the new Sync Beta service that OminGroup offers. That is likely the easiest way for typical user to get it. There is a new version posted (033) that addresses the projects not in folders and generally improves the performance of the program. It now prompts user to open the contents.xml file rather than requiring it to be opened ahead of time. This is the first version that might qualify as a “Beta” instead of an “Alpha”. I’d be interested in omnifocus opinions, especially in reference to Mindmanager and RM. 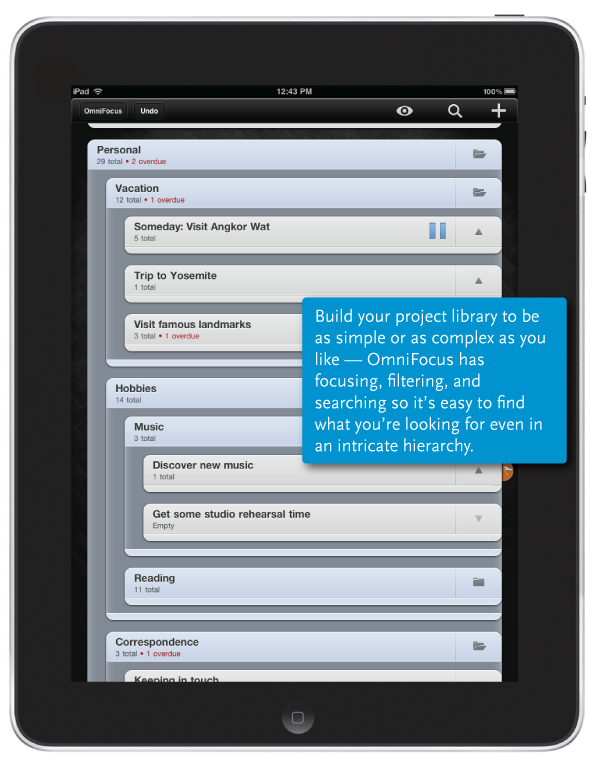 Omnifocus for Ipad is only $39.99, so its not a huge investment to try it. The ommi2map add-in will let you pull back new items into RM if needed. So far the omni2map add-in looks like a very promising solution to the points you raise. Is there a possibility for a corollary app, e.g. map2omni, that enables a user to, say, build a project and export it to OmniFocus? Its cumbersome to type in actions on the iPad — far better to use GyroQ and a keyboard to brainstorm and then download into OmniFocus. Hi Adam — Reading in the omnifocus data was doable, but creating an export from mindmanager to omnifocus would be a bigger challenge than I’m up, sorry. I actually bought a bluetooth keyboard when I was starting out as a means to type in faster. I haven’t really gone back to it for ongoing use. Great article, It is enjoyable to read a fresh take on OmniFocus. In response to your first point under the “Cons” section. The OmniGroup host an Omni Sync Server. It is free to set up an account, OmniFocus will keep your database in sync with their server. This will allow you to sync your OmniFocus data with OmniFocus for iPhone. In addition to the Omni Sync server you can sync to a WebDav server, one that I would recommend is Spootnik, where your OmniFocus data is displayed in a web view. Which can be quite useful for windows users. Thanks Adam — This was written before IOS 5 and the production release of the Omnisync server so a few of those “cons” drop a way. Spootnik seems intriguing. Will give it a try.